Phycoerythrin conjugated Goat anti Mouse IgG1 antibody (STAR132PE) used for the detection of bound antibody on lymphoblastoid cell lines by flow cytometry. Estimation of ΔBNLF2a and wild-type LCLs expressing lytic antigens; recognition by immediate early antigen-specific CD8+ T cells. 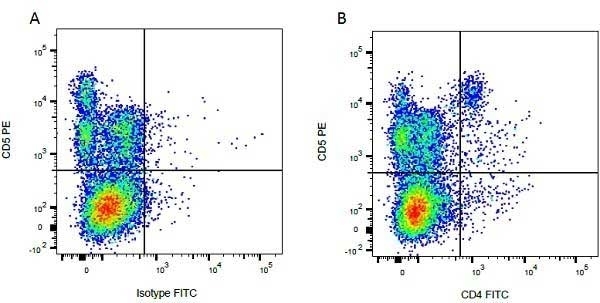 The proportion of LCLs spontaneously reactivating into lytic cycle was assessed by intracellular BZLF1 staining and analysis by flow cytometry, with representative examples shown for LCLs derived from two different donors: (A) donor 1 and (B) donor 2. Immediate early lytic cycle CD8+ T cell recognition of wild-type (wt), ΔBNLF2a (Δ2a) and ΔBZLF1 (ΔBZ) LCLs using HLA-B*0801-restricted RAK (BZLF1) clones against appropriately HLA matched donor 1 and 2 LCLs (C and D respectively) was measured by IFNγ ELISA. Results using wild-type or ΔBNLF2a cells diluted with ΔBZLF1 cells as appropriate are shown, where arrows indicate equivalent numbers of lytic antigen expressing cells. 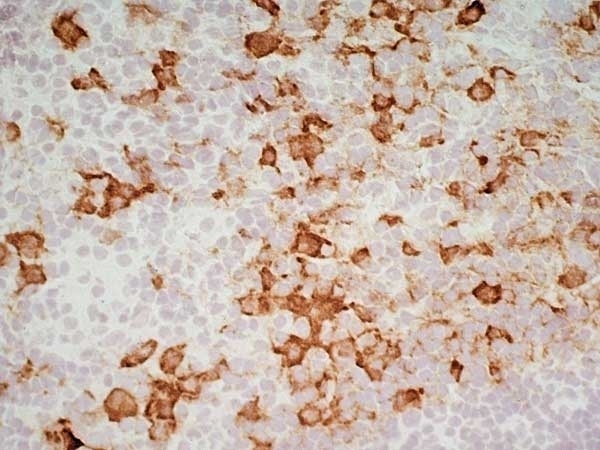 Experiments were also conducted using HLA-C*0202-restricted IACP (BRLF1) clones against donor 3 LCLs (E), and HLA-B*4501-restricted AEN (BRLF1) clones against donor 4 LCLs (F). For donor 4, both the wild-type and ΔBNLF2a LCLs were diluted with ΔBZLF1 LCL (wild-type-LCL titration data not shown). Data are represented as mean+/−SEM. From: Croft NP, Shannon-Lowe C, Bell AI, Horst D, Kremmer E, et al. 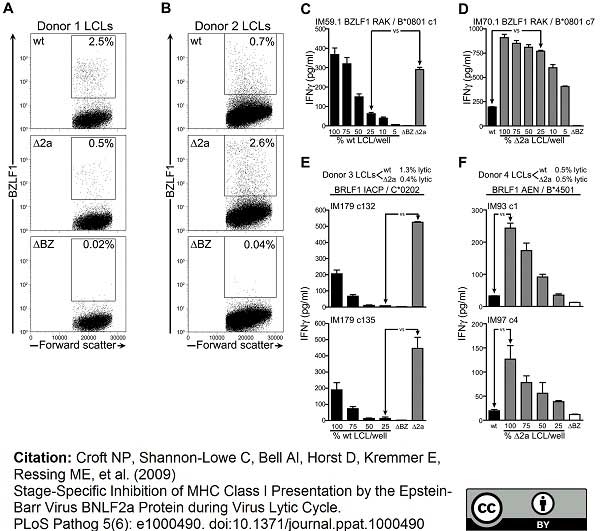 (2009) Stage-Specific Inhibition of MHC Class I Presentation by the Epstein-Barr Virus BNLF2a Protein during Virus Lytic Cycle. PLoS Pathog 5(6): e1000490. Horseradish peroxidase conjugated Goat anti Mouse IgG1 antibody (STAR132P) used for the evaluation of rotavirus specific IgG1 antibodies in mouse serum be ELISA. Rotavirus-specific IgG-subclass antibodies in serum. Geometric mean titers (GMT) in arbitrary units (AU) ± SEM of the rotavirus-specific IgG-subclass antibodies IgG1, IgG2a, IgG2b and IgG3 in serum individually collected at day 28, depicted per antibody. FITC conjugated Goat anti Mouse IgG1 antibody (STAR132F) used for the detection of bound Mouse anti BrdU antibody by immunofluorescence. Sequential labelling using EdU and BrdU. Microscopy pictures of cells double-labelled with EdU and BrdU. Cells synchronized in G1 phase were released and pulse-labelled in two consecutive S-phases, first with EdU, then with BrdU, as described in the text. Samples were harvested after the next mitosis, fixed and processed as described and imaged using fluorescence microscopy. From: Anda S, Boye E, Grallert B (2014) Cell-Cycle Analyses Using Thymidine Analogues in Fission Yeast. PLoS ONE 9(2): e88629. Microscopy pictures of cells labelled with EdU or BrdU. Cells were labelled with either analogue and detection for both analogues was performed to check cross-reactivity. 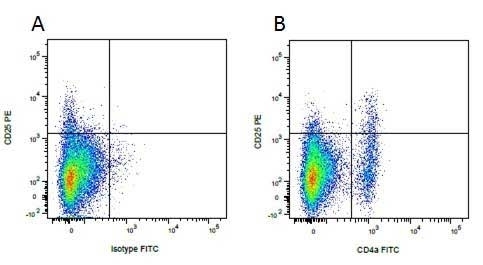 Figure A. FITC conjugated mouse anti porcine CD4a (MCA1749F) and purified mouse IgG1 isotype control (MCA928) detected with goat anti mouse IgG1PE (STAR132PE). 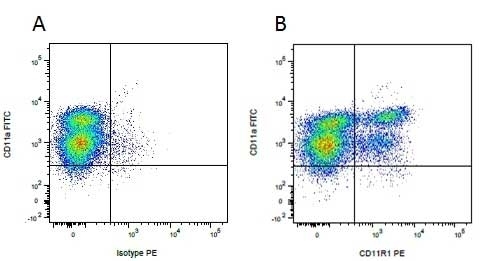 Figure B. FITC conjugated mouse anti porcine CD4a (MCA1749F) and purified mouse anti porcine CD25 (MCA1736GA) detected with goat anti mouse IgG1PE (STAR132PE). All experiments performed on red cell lysed porcine blood gated on mononuclear cells. Figure A. Purified mouse anti porcine CD25 (MCA1736GA) detected with goat anti mouse IgG1 PE (STAR132PE) and mouse IgG2b FITC isotype control (MCA691F). Figure B. Purified mouse anti porcine CD25 (MCA1736GA) detected with goat anti mouse IgG1 PE (STAR132PE) and mouse anti porcine CD4a FITC (MCA1749F). All experiments performed on red cell lysed porcine blood gated on mononuclear cells. Figure A. FITC conjugated mouse anti porcine CD11a (MCA2308F) and purified mouse IgG1 isotype control (MCA928) detected with goat anti mouse IgG1 PE (STAR132PE). Figure B. FITC conjugated mouse anti porcine CD11a (MCA2308F) and purified mouse anti porcine CD11R1 (MCA1220) detected with goat anti mouse IgG1 (STAR132PE). All experiments performed on red cell lysed porcine blood gated on mononuclear cells. Figure A. Purified mouse anti porcine CD11R1 (MCA1220) detected with goat anti mouse IgG PE (STAR132PE) and mouse IgG2b FITC isotype control (MCA691F). 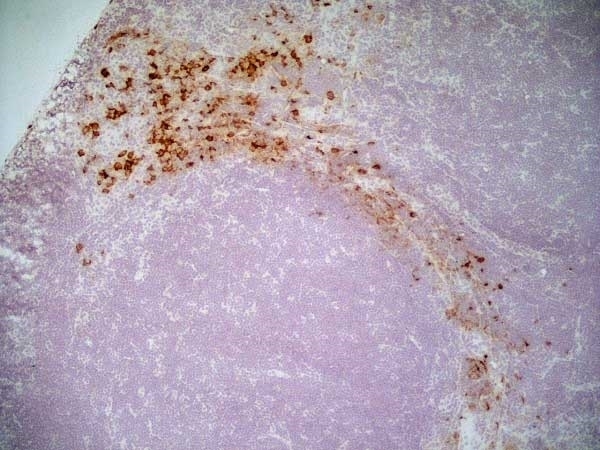 Figure B. Purified mouse anti porcine CD11R1 (MCA1220) detected with goat anti mouse IgG1 PE (STAR132PE) and mouse anti porcine CD11a FITC (MCA5951F). All experiments performed on red cell lysed porcine blood gated on mononuclear cells. 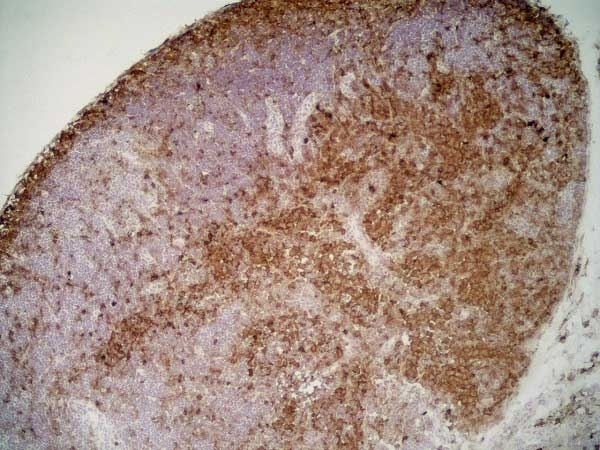 Figure A. FITC conjugated mouse anti porcine CD11a (MCA2308F) and purified mouse IgG1 isotype control (MCA928) detected with goat anti mouse IgG1 PE (STAR132PE). 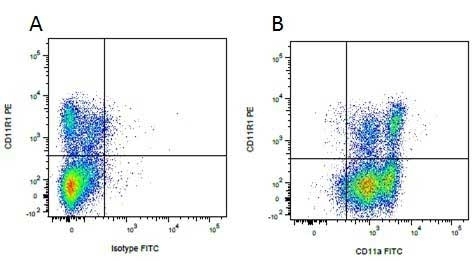 Figure B. FITC conjugated mouse anti porcine CD11a (MCA2308F) and purified mouse anti porcine CD46 (MCA2262) detected with goat anti mouse IgG1 (STAR132PE). All experiments performed on red cell lysed porcine blood gated on mononuclear cells. Figure A. Purified mouse anti bovine CD5 (MCA835GA) detected with goat anti mouse IgG1 RPE (STAR132PE) and FITC conjugated mouse IgG2a isotype control (MCA929F). Figure B. Purified mouse anti bovine CD5 (MCA835GA) detected with goat anti mouse IgG1 RPE (STAR132PE) and FITC conjugated mouse anti bovine CD4 (MCA1653F). All experiments performed on red cell lysed bovine blood gated on mononuclear cells. 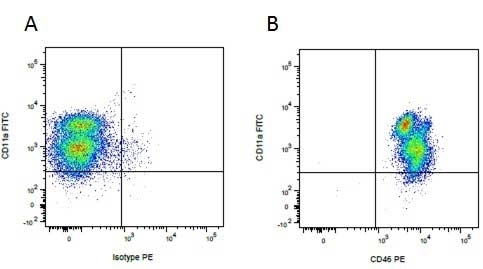 Figure A. FITC conjugated mouse anti bovine CD4 (MCA1653F) and purified mouse IgG1 isotype control (MCA928) detected with RPE conjugated goat anti mouse IgG1 (STAR132PE). 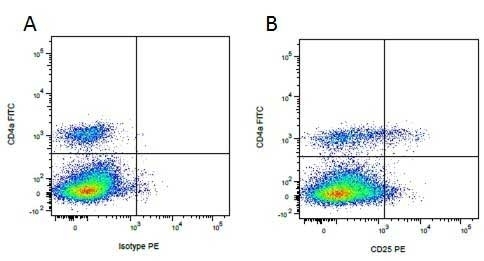 Figure B. FITC conjugated mouse anti bovine CD4 (MCA1653F) and purified CD5 (MCA835GA) detected with RPE conjugated goat anti mouse IgG1 (STAR132PE). All experiments performed on red cell lysed bovine blood gated on mononuclear cells. Figure A. Purified mouse anti bovine CD13 (MCA2338GA) detected with goat anti mouse IgG1 RPE (STAR132PE) and FITC conjugated mouse IgG2b isotype control (MCA691F). Figure B. Purified mouse anti bovine CD13 (MCA2338GA) detected with goat anti mouse IgG1 RPE (STAR132PE) and FITC conjugated mouse anti bovine CD11b (MCA1425F). All experiments performed on red cell lysed bovine blood gated on mononuclear cells. 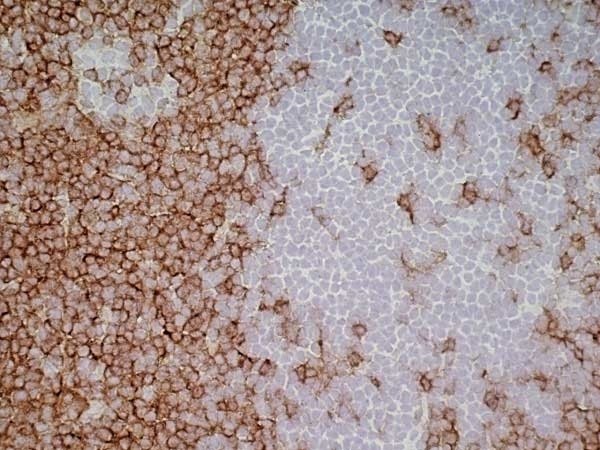 Figure A. FITC conjugated mouse anti bovine CD11b (MCA1425F) and purified mouse IgG1 isotype control (MCA928) detected with RPE conjugated goat anti mouse IgG1 (STAR132PE). 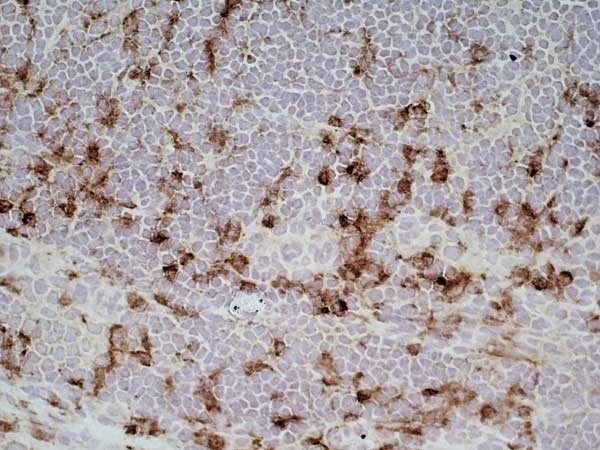 Figure B. FITC conjugated mouse anti bovine CD11b (MCA1425F) and purified CD13 (MCA2338GA) detected with RPE conjugated goat anti mouse IgG1 (STAR132PE). All experiments performed on red cell lysed bovine blood gated on mononuclear cells. Goat anti Mouse IgG1:Alk. Phos. Goat anti Mouse IgG1 antibody recognizes Mouse IgG1. 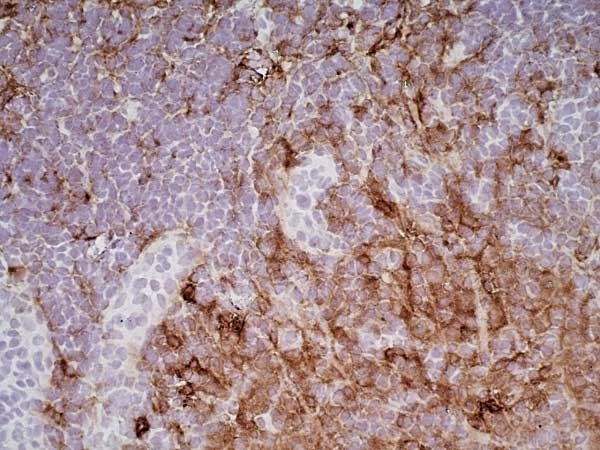 This antibody has been cross absorbed against mouse IgM, IgG2a, IgG2b, IgG3 and IgA, pooled human sera and purified human paraproteins. 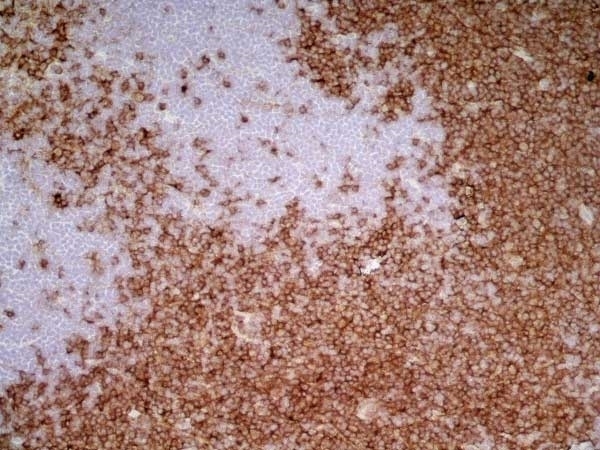 Goat anti Mouse IgG1 antibody shows minimal cross-reactivity with human immunoglobulins. 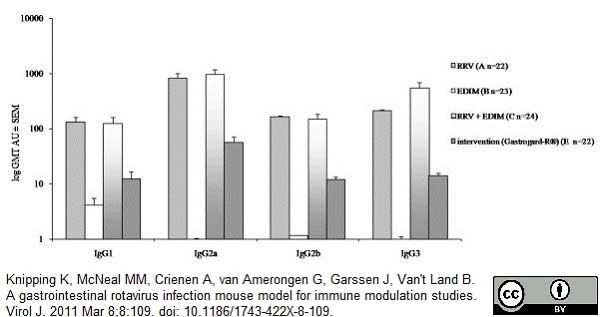 Antisera to mouse IgG1 were raised by repeated immunisation of goats with purified antigen. Purified IgG was prepared from whole serum by affinity chromatography. Croft, N.P. et al. (2009) Stage-specific inhibition of MHC class I presentation by the Epstein-Barr virus BNLF2a protein during virus lytic cycle. Zuo, J. et al. (2011) The Epstein-Barr virus-encoded BILF1 protein modulates immune recognition of endogenously processed antigen by targeting MHC class I molecules trafficking on both the exocytic and endocytic pathways. Young, D. et al. (2012) Soy-derived di- and tripeptides alleviate colon and ileum inflammation in pigs with dextran sodium sulfate-induced colitis. J Nutr. 142 (2): 363-8. Bagai, U. and Pawar, A. 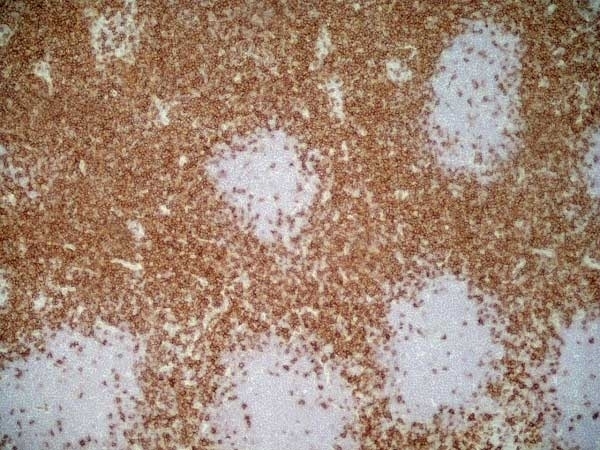 (2013) A blood stage fraction of Plasmodium berghei induces protective and long lasting immune response in BALB/c mice. Anda, S. et al. 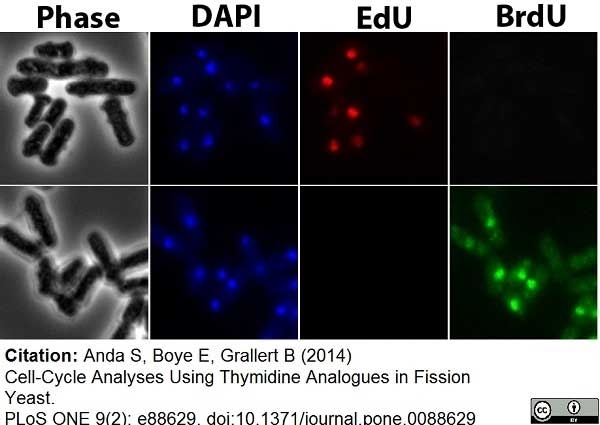 (2014) Cell-cycle analyses using thymidine analogues in fission yeast. PLoS One. 9 (2): e88629. Kamat, M.M. et al. (2016) Changes in Myeloid Lineage Cells in the Uterus and Peripheral Blood of Dairy Heifers During Early Pregnancy. Ramanathan, R. et al. (2015) Transplantation of human stem cell-derived hepatocytes in an animal model of acute liver failure.